The Tennant 3610 is a compact walk-behind sweeper, perfect for commercial applications. This sweeper can handle all of your vacuum cleaner tasks without a cord! The 3610 has a simple operator panel with one button operation. Two sweeping modes are available; light, and heavy sweep. The vacuum fan turns on automatically when sweeping. 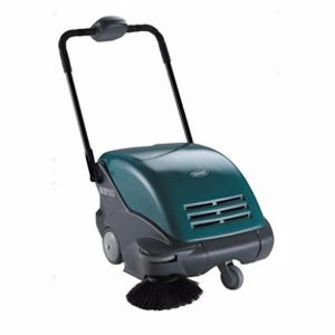 Both the side broom, and main broom adjust to varying surfaces automatically. Easily adjust the handlebar for user comfort. An automatic filter shaker activates every three minutes to maintain optimal dust control. The filter assembly consists of a pre-filter and paper panel filter with ten square feet of surface area. This filter assembly is good to 3.0 microns at 99.7% efficiency. The 3610 has a large debris hopper with ten times the capacity of an upright vacuum cleaner. Debris hopper is also easy to remove and dump. No tools are required to replace the filter, main broom or side broom! All of the wheels on the 3610 have gray non-marking tires.